First mistake: sticking to a plan just because you think sticking to a plan is a good thing. Why? 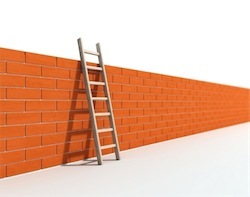 When sticking to the plan is like running into a brick wall, get a ladder. When you travel, and weather interferes, flights get cancelled, hotels are worse than hoped, do you stick to the travel plan? On the playing field, when the game goes off in a different direction, and surprises you, do you stick to the game plan? Why then do you assume you’re going to stick to a business plan? Second mistake: not planning because you aren’t going to stick to the plan anyway. Would you not plan the trip because flights might change? Or the game because the opponents might surprise you? Not hardly. It’s a business plan, not a straight jacket. It doesn’t narrow your options; it makes them easier to manage. Having the plan gives you a sense of strategy, priorities, long-term goals, steps along the way, responsibilities, interdependencies, metrics, tasks, and resources. It helps you manage change. So when things change – and of course they will – that’s not more of a problem when you have a plan; the plan connects the dots so you can move things around more quickly. It’s bad to stick to a plan that was based on assumptions that have since changed. It happens far too often. The idea that having a plan means being locked in, forced to stick to it, confuses the daylights out of people. They start to argue against having a plan because of it. As if having a plan doesn’t help you navigate better when there are changes. As if having a plan reduces your freedom to change course, which is simply not true.